Singapore – Digital creative agency noisycrayons collaborated with Mediacorp’s Vizpro International to launch The Quest for Speed, a digital engagement campaign for Tokyo Auto Salon Singapore, an automobile convention that features the best of Japanese automobile technology. The initiative activated automobile enthusiasts from Singapore to follow Tokyo Auto Salon on social media where they received by-the-hour show updates and were rewarded with lifestyle perks that included free flights to Tokyo and access passes to watch ‘live’ performances by popular Japanese girl band AKB48. 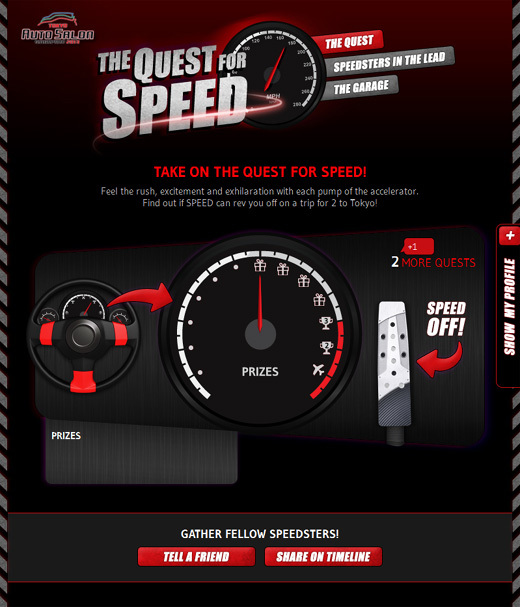 The Quest for Speed was deployed on social media via a Facebook application that gratified the audience with instant rewards as they take their place at the driver’s seat and step on an accelerator pedal to activate a speedometer. Thousands of automobile enthusiasts were engaged online and directed to the ticketed event to redeem their rewards. The campaign saw more than 10,000 automobile enthusiasts follow the event on social media to uncover speed at the inaugural showcase of the finest and most unique cars from Japan and brought the total fan base of Tokyo Auto Salon Singapore on Facebook to more than 15,000 in 2 weeks. The digital consumer engagement programme for Tokyo Auto Salon Singapore 2013, is managed by noisycrayons.